The inguinal canal is an oblique canal which runs from the deep ring (mid point of inguinal ligament) to the superficial ring in the inguinal region. 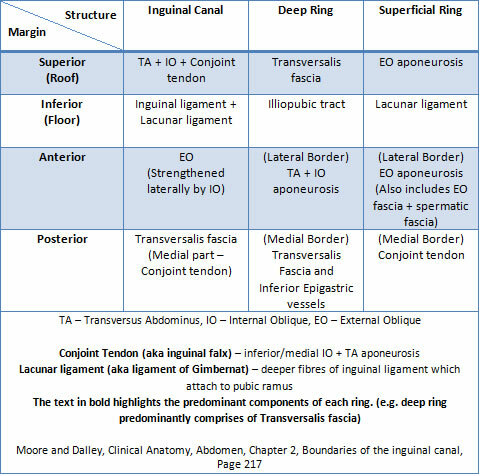 Superior (Roof): From lateral to medial is comprised of Transversus abdominus aponeurosis, internal oblique aponeurosis and conjoint tendon. Disclaimer: These notes are to act as an aide memoire. Different methods exist. Ensure you have the proper supervision before attempting an operation that you are not competent in.